The Aquarum (tank), lights and base: Firstly, you need to consider where to put your tank, once it is full of water it will be very difficult to move. Your aquarium should be positioned near a mains power supply, away from draughts and direct sunlight to avoid the growth of algae, and out of reach of small children or pets. It is always better to use a stand that is made for the aquarium, in fact some manufacters will not guarantee the tank if you don't. 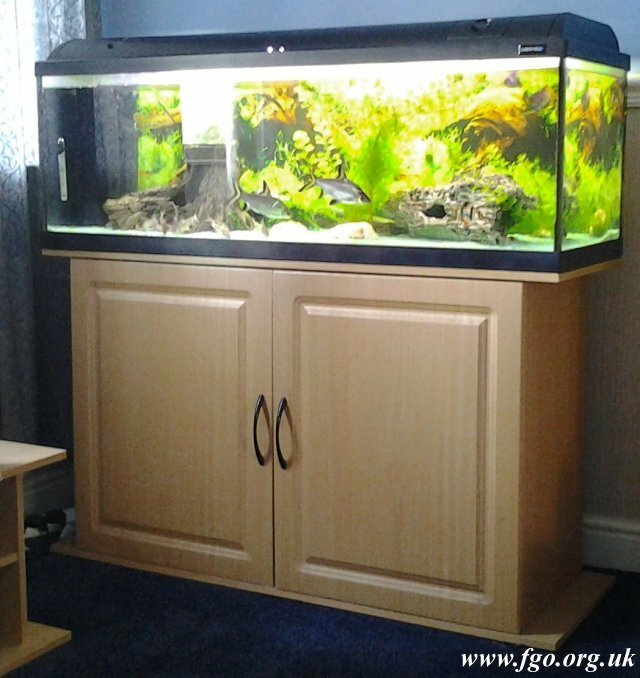 However I do recommend you use a specially made aquarium stand or cabinet to hold the tank level or hairline cracks may occur. Use aquarium foam or polystyrene pads to cushion the tank if it does not have raised glass on the bottom and place your tank away from electrical equipment. Most tanks will come with a hood containing lights this is important in that you can create a natural day and night environment for your fish and live plants. Howver there are various options if not. I would also advise that you put your ighting on a timer, too much light can cause algae. You can also add a background on your aquarium to further enhance its appearance. There are other things that you will also need. Heater: This is essential if you want to keep tropical fish, the size required depends on the size of your tank. Thermometer: If you are keeping tropical fish you need a thermometer that is visible so that you can check that the temperature stays constant and doesn't fluctuate. Aquarium Filter: Internal or external, this is a matter of choice and dependant on the size of the tank. It is a critical components of both freshwater and marine aquaria. Filters remove physical and soluble chemical waste products from tanks, simplifying maintenance. Filters are necessary to support life as tanks are relatively small, closed volumes of water compared to the natural environment of most fish. Fish, kept in tanks produce waste from excrement and respiration. Another source of waste is uneaten food or plants and fish which have died. These waste products collect in the tanks and contaminate the water. As the degree of contamination rises, the risk to the health of the aquaria increases and removal of the contamination becomes critical. Filtration is a common method used for maintenance of healthy aquaria. Gravel/Sand (Substrate): Provides a natural environment for your fish and a good rooting base for live plants. 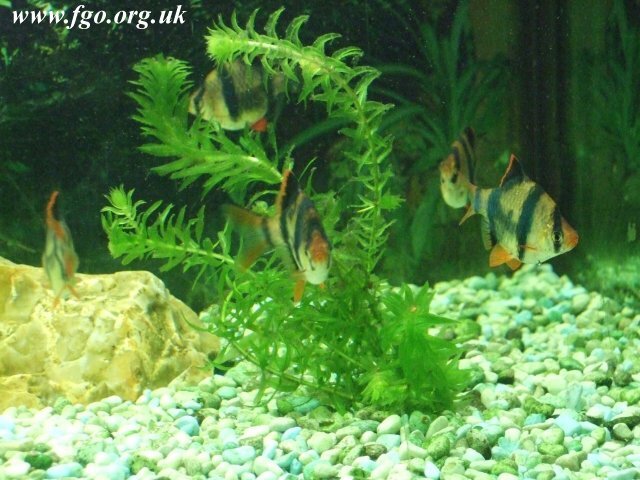 Plants: Live or artificial: they help to create a natural environment for your fish. Live plants also provide an important alternative food source for many types of fish. This is Elodia one of the more common oxygenator plants. I have noticed when browsing the internet that there is some doubt whether or not there are any underwater flowering plants for aquariums. 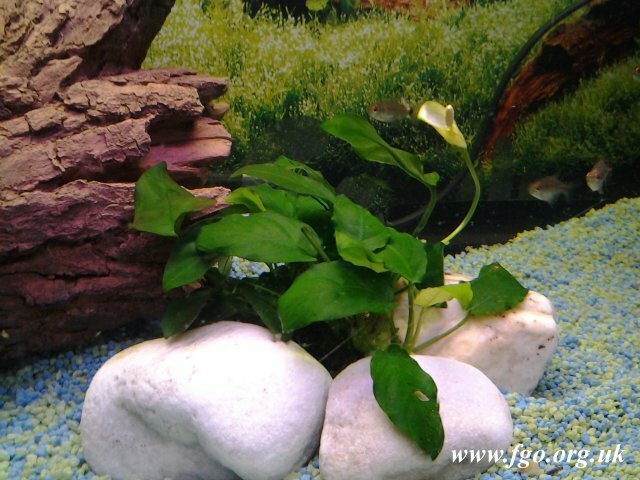 Amongst other plants I have Anubias and these do have a white flower.